The Association of Legal Aid Attorneys along with dozens of unions, immigrant rights organizations, and community groups held a rally on December 7, 2017 at Brooklyn Borough Hall to call on the Office of Court Administration and Chief Judge Janet DiFiore to prohibit Immigration & Customs Enforcement agents from entering state courthouses, and to end coordination with ICE. For 25 years, schools, hospitals and places of worship have effectively been off-limits to federal immigration officers. Now, a group of dozens of former state and federal judges is asking U.S. Immigration and Customs Enforcement to add courthouses to the list of "sensitive locations" where their officers generally do not go. "Judges simply cannot do their jobs — and our justice system cannot function effectively — if victims, defendants, witnesses, and family members do not feel secure in accessing the courthouse," said the judges in a letter Wednesday to Acting Director Ronald Vitiello. "ICE's reliance on immigration arrests in courthouses instills fear in clients and deters them from seeking justice in a court building." The judges cited reports of a marked increase in ICE activity in courts over the past two years. One study by the Immigrant Defense Project found a 1200 percent increase in arrests and attempted arrests across New York state from 2016 to 2017. Arrests have been documented in dozens of states, the judges wrote, affecting survivors of domestic violence, parents seeking to protect their children from unsafe living conditions, and even victims of human trafficking. "We know firsthand that for courts to effectively do justice, ensure public safety, and serve their communities, the public must be able to access courthouses safely and without fear of retribution," the judges said. "For many, however, ICE's courthouse arrests have made courts places to avoid." In a January memo, ICE said it would limit its civil immigration enforcement actions inside courthouses to only certain people, such as gang members, those with criminal convictions, or people who pose national security threats. ICE officers won't go after family members of arrest targets unless they try to intervene. Officers "should exercise sound judgment when enforcing federal law and make substantial efforts to avoid unnecessarily alarming the public," the memo said. That assurance didn't go far enough, the judges wrote. 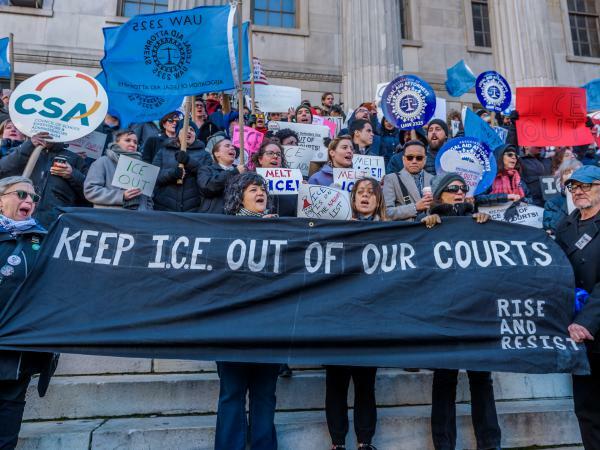 "Following nearly two years of high profile ICE courthouse activity, only unequivocal guarantees and protections will restore the public's confidence that it can safely pursue justice in our nation's courts." In an FAQ on its web site, ICE says that "courthouse arrests seem to be occurring more frequently" because some law enforcement agencies no longer work with ICE agents as easily as they used to. "The increasing unwillingness of some jurisdictions to cooperate with ICE in the safe and orderly transfer of targeted aliens inside their prisons and jails has necessitated additional at-large arrests."